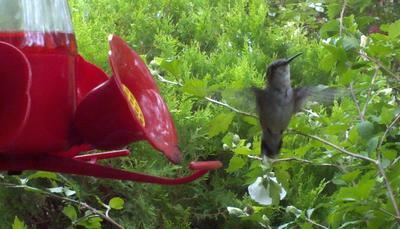 This is my first close encounter with hummingbirds. I had sporadically put out the feeder over several summers ... hoping to lure one into sight. After a few years, I finally saw one buzz pass my Hibiscus. I then got serious & did my research. Last summer, I made sure the feeder was always full of fresh food. I'd hurry home after work & stand as still as a statue by the feeder, camera in hand, risking starvation (capturing a photo of a hummer was more important than eating dinner) and risking malaria (this photo was taken in August ... I live near the marshes along the Northeastern Atlantic Coastline ... a mosquito's heaven). Finally!!! At the end of August, this little one spent a few minutes at my feeder, turned toward me & hovered as if saying, "to show my gratitude for dinner, I will allow you that elusive photo you've been wanting ... but hurry ... I've gotta fly!"